Practice Areas: New York Labor Law, Professional Liability, Premises Liability and General Negligence. Matthew J. Zizzamia graduated from the University of Arizona with a B.A. in 1997, and from the University of Texas School of Law in 2001. 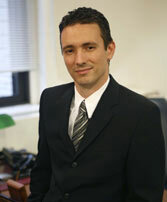 Mr. Zizzamia previously worked as an associate at two New York City law firms, where he handled high exposure cases on behalf of residential and commercial property owners and contractors in a wide variety of matters involving insurance coverage disputes and toxic tort litigation, to Labor Law, premises liability and general liability claims. Mr. Zizzamia joined Hannum Feretic Prendergast & Merlino and 2008 and has been partner since 2012. His current practice focuses on complex construction litigation and indemnity analysis, premises security and premises liability matters. An experienced trial attorney, Mr. Zizzamia has tried numerous cases to verdict on behalf of both plaintiffs and defendants in multiple venues throughout the State of New York. He also has an experienced and diverse appellate practice, and has successfully argued multiple cases before the Appellate Divisions of the New York State Supreme Court. Google verification code to assist a webmaster to authenticate the website with Google's Webmaster tools. __ab12# cookie allow sharing content on social media.